On Thursday evening I was delighted to attend a very interesting hustings meeting organised by Friends of the Earth Tayside and the Dundee Cycle Forum. We were asked to give a few opening remarks on the topic of People, Place and Transport the gist of my remarks is below. I want Dundee to have the best environment possible and I will work with groups like Friends of the Earth Tayside and the Dundee Cycle Forum to play my part in doing just that. I have been a councillor for ten years and in my time on the council I think that my commitment to protecting our environment has been clear. I think that we live in a magnificent city and that we should do all that we can to ensure that it stays that way. That is why I led the opposition on the council to an industrial scale biomass plant in the docks and secured cross-party support for that on the council. I was glad to be able to lead a cross-party group of councillors in that opposition even if we were told that we were all too stupid to understand the the hard science by the current council leader. I have been calling for proper action year after year after year about air pollution issues in the city, especially on the Lochee Road in my area. I think that Dundee should consider applying to be a low emission zone. We need to do all that we can to protect this great place we call home. Whether by that you mean the West End, Dundee, Scotland, the UK, Europe or planet earth. Close to home I am looking for investment in our parks and green spaces. This is important for the future of our city. It is too easily overlooked at this time of £80 million worth of cuts over the last ten years. 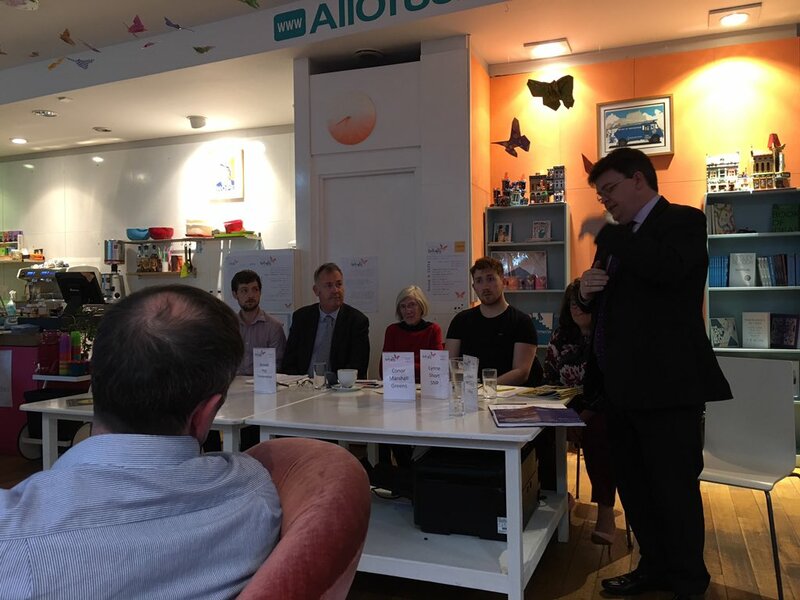 I also want to support more renewable energy and I am pleased to say that I am part of a group looking at setting up a Solar Energy Co-operative in Dundee, Scotland's sunniest city. This has been done in Edinburgh and it is important that we look to promote renewable energy where we can. For example, the new Harris Academy is a south facing building with a huge roof space and no solar panels on the roof - a missed opportunity. I also want to promote more district heating systems. We are heading towards 2019 and the centenary of Scotland's first council housing estate in the the Logie Estate in my ward. It was built with a district heating system, which apparently heated the pavements as much as the houses but the technology is so much better now and we need to work to deliver district heating schemes, bulk buying schemes and energy efficiency schemes where we can. Transport is hugely important and we need to find a balance. We know that access to a car is at a relatively low rate in Dundee compared to other places yet transport policy is dictated by car users. We do need good roads and I looking for improvements to the state of the roads in large parts of the West End. Potholes which damage cars are bad for the environment. However, we are too reliant on the car, and I include myself in that. We need to ensure that we can combat that reliance on the motor car. We need to make public transport more attractive. The ABC cards on Dundee buses are a step forward but what we need is an 'Oyster' card style system in Dundee certainly but preferably across Scotland. A system that is genuinely about joint ticketing and which charges the user the lowest cost at the end of the day. As a Scottish Co-operative Party candidate in this election I support their 'People's Bus' campaign and I also support Unite the Union's 'Haud the Bus' campaign. There are people in the West End who have a great bus service but there are places which are neglected. There are a number of ex-bus stops in the West End in places like the far-end of the Perth Road or Tullideph Road. It is a disgrace that profitable bus companies can effectively just turn round to the council and more importantly the people of Dundee and say that we are not going to run a service there and there is virtually nothing that the council or the general public can do about it. We need to change the relationship with bus services. We need to say to companies that if they want to operate profitable routes then they also need to run socially useful services. There is a huge hidden indirect subsidy to bus companies in this country and the public gets very little in return for it. We need to empower local people to ensure that they have a say in how bus services are run in their area. We should also look to improve local train journeys. We need to ensure that Dundee remains connected with the major cities of Scotland and the UK but we also need to make sure that we also have connections along the Tay. We should promote commuting options along the Tay. Estuary by train. This has been talked about for years - we need delivery now. I support active travel and I think that we need to invest in active travel and I support spending 10% of the transport budget on walking and cycling. We have high hopes for our city as a destination with the V & A and hopefully as European City of Culture in 2023. I want us to be a cycle friendly European city. More needs to be done around the Waterfront development to deliver a pedestrian and cycle friendly environment and welcome to the city. We should also use Dundee's position as a UNESCO City of Design to ensure that the highest standard of design is expected right across the city. We should also expect to be at the forefront of using that status to design a good environment. I also paid tribute to my colleague Councillor Laurie Bidwell, who is standing down from the council at this election. Laurie has been a champion of active travel and particularly of cycling over his ten years on the council and the council will need to find another champion of the active travel after the election to match his commitment.